For Govt of Sindh job seekers job is there from Sindh Child Labor Survey Jobs 2017 Latest June Advertisement. Applications are currently being offered from the Project "Child Labor Survey Sindh" is seeking to hire the high profiled, caliber and adroit applicants are required to fill the technical posts which are named as (Female Enumenator, Supervisor (Data Coder) and Data Coder) are the given vacancies which needs to be filled with overall qualification of Bachelor's Degree in Computer Science, IT and Engineering is required from well recognized institute with 3 year;s relevant practical expertise are needed to apply for such posts. Appointment will be made on contract basis. 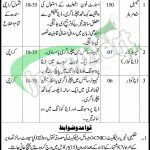 Only domicile holders of Sindh are eligible to apply for such posts. Attractive salary package with growth opportunities and fringe benefits will be given to the applicants. Now, I will highlight its some other information in the upcoming headings below. Sindh Child Labor Survey is working under the administration of Government of Sindh and is held responsible to estimate the ratio of Child Labor and is working to eradicate this gruesome situation form every part of Province and educate the children which is their basic rights and is looking for its better steps. Being a Govt body it offers Govt jobs of different educational levels. All those applicants who possess the domicile of Sindh are are interested for applying needs to submit their CV along with Covering letter and two passport size newest photographs should reach at the said address. At the time of interview bring original documents. Address: Directorate of Labor, Block 86, Sindh Secretariat, 4th-B, Court Road, Karachi.